This space is dedicated to bringing the story of our activism full circle, without omission or narrative agenda. Though the information provided below is lengthy, we encourage you to read it and develop your own opinions around this cause. This page will be updated regularly to reflect the dialogue. Thank you for your personal letter. Yes, I received several tweets the other night and have monitored this story over the past couple of days, so I am aware of your press release and protest of the meeting at James Madison University. While I regret that your experience with NAMB’s Collegiate Church Planting Collaborative has been what you call a “complete contradiction to reconciliation,” I also know the hearts of the two men you name in your correspondence. Brian Frye and Al Gilbert are both godly men, men with a passionate desire to see all souls have a saving relationship with our Lord Jesus Christ. They want to see all twenty-two million college students in America come to Christ. Permit me to step back historically to set a bit of context. For too many years, black and white Baptists were content to live in their own worlds. During that era, Southern Baptists largely addressed the dominant culture, first in the south, then across the United States. National Baptists targeted evangelism among historically black communities, including the historically black colleges and universities. In recent years, we have all realized that we must work more closely together for Kingdom purposes. On our side of the equation, the SBC has continued to make gains in its ethnic diversity. More than 20 percent of our congregations are non-white. The SBC National African American Fellowship is comprised of more than 3,500 churches and its leadership is highly involved at every level of Southern Baptist life. This past year, of the appointments a President can make, close to 20 percent of my appointments were non-white. I have been highly intentional in this effort. NAMB’s CCP movement is a fairly recent development. Its initial growth emerged from collegiate ministries where we have had a stronger presence. Since National Baptists have taken the lead in ministering on historically black campuses, we have not had as strong a Southern Baptist presence there. So, as you noted, the initial leadership of the CCP movement has looked more white than diverse. Your invitation to participate was an effort to build a relationship with you that could serve as a bridge to the black community. I truly hope you will set aside your feelings of offense and meet with Brian and Al to move this dialogue forward. These are godly men who want to walk in unity to reach this world for Christ. Dr. Jerry Young, president of the National Baptist Convention of the USA, Inc., and I share a common goal that led to our August meeting in Jackson, Mississippi, for a time of worship: we believe building relationships is a necessary step toward lasting reconciliation. We also believe that genuine reconciliation is, at its heart, a Gospel issue. Jesus’s death and resurrection abolished the wall of separation. Dr. Young and I have since met for a more focused conversation, each bringing ten pastors from our respective conventions, and have plans for future meetings, including a meeting next week in New York. The church is the key to advancing the hope of the gospel to all peoples. We must work together. It is my hope and prayer that you will meet with Brian and Al to help us move forward in our common desire to reach all persons with the saving and transforming message of Jesus Christ. Our students are our future. Clearly, this is a vitally important area where there is work yet to be done. Perhaps the Lord has raised you up for such a time as this. 1. In your response, you stressed your desire for Brian, Al and I to meet. However, you, nor have they, taken responsibility for the fact that I asked for a meeting back in February/March and that request was ignored and shut out of their responses. The sudden urge to meet is only because of our activism not our issues and the SBC must take responsibility for that as well. If you have been following the issues and dialogue that I have made public then you should have noted that Al and Brian deflected and neglected calls for meetings. Having my phone number, neither of these men of God, have made any personable attempts to engage us or our concerns either, since February. 2. Apparently, your lieutenants only want to meet "privately" and on their terms and that is disturbing as well. While they were quick to post a link publicizing their request to meet with me, intentionally stating that they are waiting on my response, they haven't even responded to my response, nor have they acknowledged it. Perhaps the fact that I responded in requesting that they meet with the students and myself, starting the dialogue while we are here is disturbing to their agenda? 2- aren't even responding to us without us having to posit activism and force the conversation through social media, perhaps it isn't Brian and Al that I need to be meeting with altogether. Respectfully, I ask that your leadership speak and respond to those specific concerns. I have copied my response to Brian below and am STILL waiting on his followup. 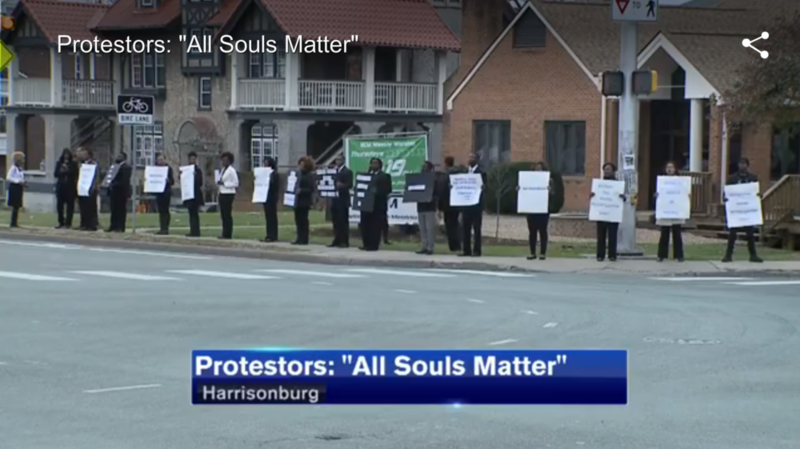 "This is a movement to debunk systematic religious racism at all levels in the largest protestant church in America. " Per Brian Frye, Rev. Drumwright received an invite to meet with the North American Mission Board leadership the morning after college students demonstrated civil disobedience at their collaborative event. Shortly, thereafter, CCPC posted the letter to Rev. Drumwright on their website, positing it as being "Efforts Towards Diversity" while citing that they are waiting to hear from Rev. Drumwright, but, in fact they received a response from him just hours later. As it currently stands, (Wednesday, Nov. 18, 8am), there has been no reply from Brian Frye/NAMB. We are not interested in "private" dialogue, and we stand as one. As it currently stands, NAMB's "efforts" amounts to words on a screen....see the dialogue below and follow the conversation. 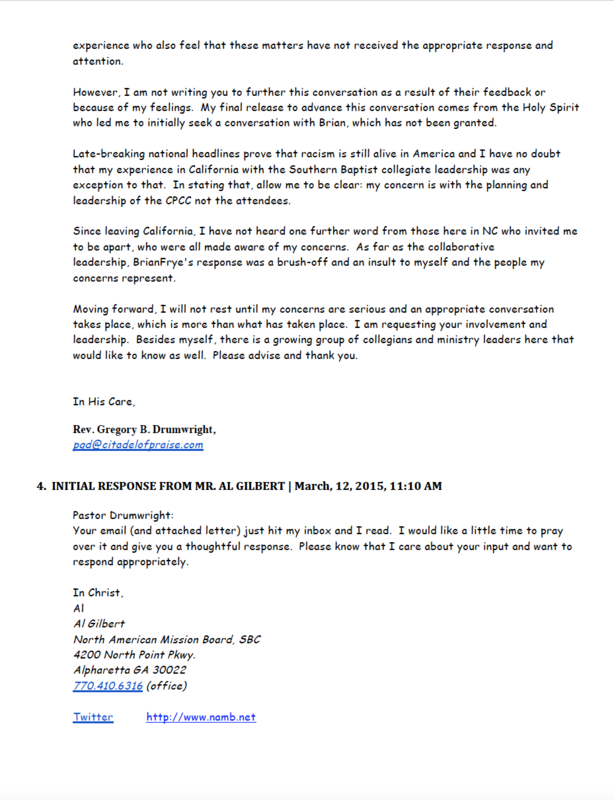 Please be aware, that this "Effort Toward Diversity" and invitation to meet with Rev. Drumwright only comes as a result of our activism, not NAMB's sensitivity for our concerns for diversity and equity. This is realized by the fact that Rev. 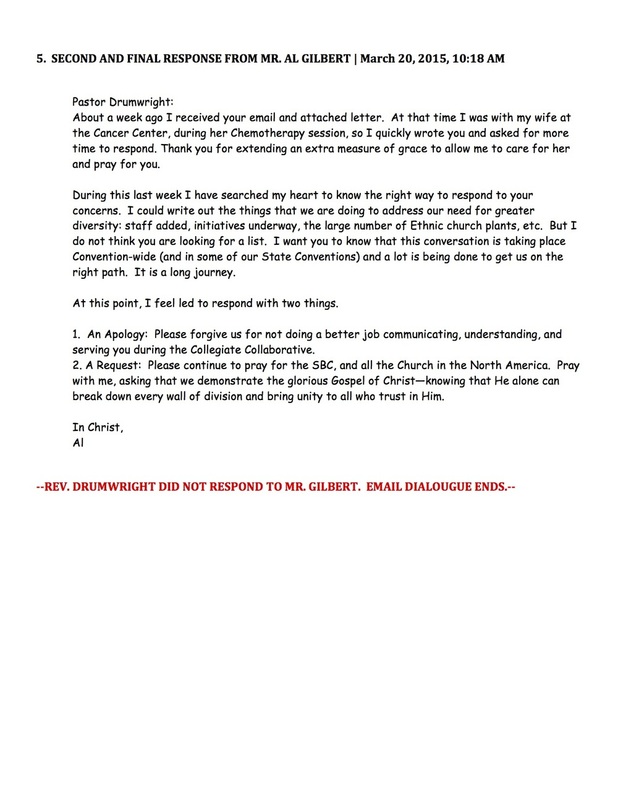 Drumwright's request to meet and engage in meaningful dialogue with SBC back in February and March of 2015, was ignored in exchange for an apology and prayer. In their invitation (posted below), Brian Frye only acknowledges Rev. Drumwright. 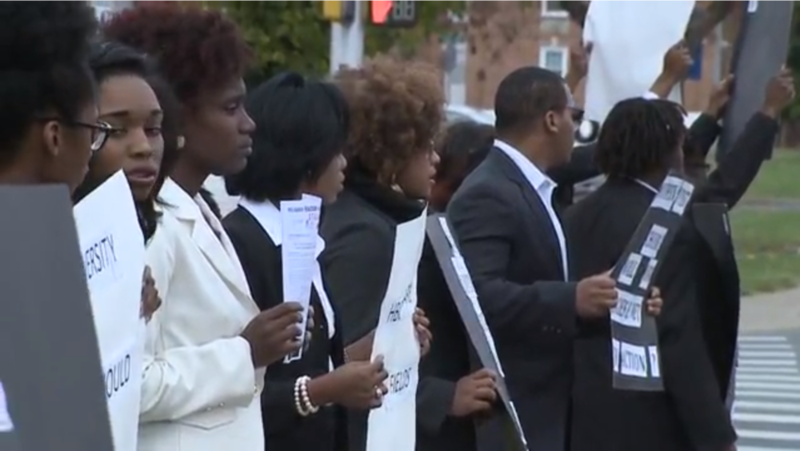 However, 25 college students stood with Rev. Drumwright in protest of the Collegiate Church Planting Collaborative. Did they not see us too? The SBC Collegiate Missions must realize that this is not to be dealt with as a personal concern of one man. Currently, there are hundreds of concerned persons: students, pastors, community leaders, SBC convention affiliates, and national civil rights leaders that stand with our concerns. As time moves forward, and until we engage in proper dialogue and progress towards resolution for the inclusion of African American collegiates and their stakeholders, this movement will be realized and will be a force for change. Interestingly, Alethia Church, the hosts for the Mid-Atlantic Collaborative in Harrisonburg has been scrubbed from the CCPC website. While we do not know if this is directly resulted to our protest, Rev. Drumwright did receive a direct conversation from Alethia leadership Monday at the demonstration in which they shared their burden for collegiate missions at HBCU's and is subsequently planning a launch. THANK YOU ALETHIA! We are not asking people to join our side, we are asking people who have a burden for equity, equality, and diversity in ministry missions to join our call to bring attention to the truth. We cannot continue to use the language of the Gospel and not be held accountable to it. 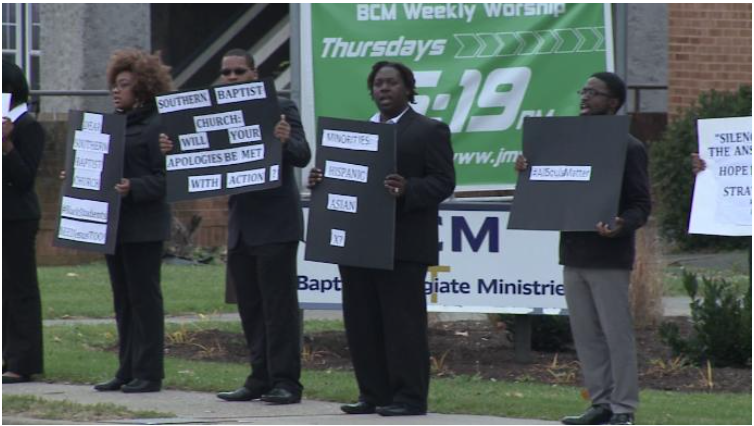 The SBC President, Ronnie Floyd, who's leadership has been at the helm of a call for change and reconciliation with African Americans, has been informed of these events and has not responded. North American Mission Board (NAMB) leadership would like to invite you to NAMB to meet privately in order to discuss your concerns in detail. We would like to meet at your convenience, and we would like to cover the expense for your trip. If you would rather meet in North Carolina, we are happy to meet where you are as well. We look forward to learning more about concrete steps you would suggest we should take in order to make progress on your areas of concern. We are committed to effectively sharing the Gospel on college campuses and throughout North America, and we are committed to racial unity with our brothers and sisters of all races and ethnic backgrounds. Thank you in advance for your response. I hope to hear from you soon. 2- following meeting the request expressed in point 1, I will then look to accept your request and meet with you and your leadership.